Are you in market to make money or bang your head against the wall. If you are here to make money; then just remember that you just need to trade bare minimum and let the profit run. 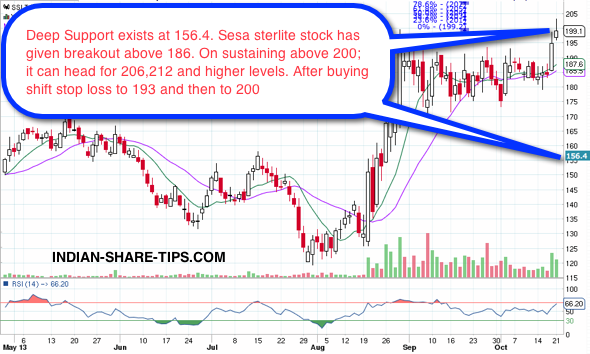 The same analogy can be applied to day trading where we are giving you the stock which has a huge profit potential on the upside and with demand from China increasing; the stock of Sesa Sterlite with code SSLT is in breakout mood. Have a look at below stock chart which gives you the story of the stock from both long term and short term perspective. The stock has given a breakout and stock on sustaining above 200 level with volume can achieve new heights and remember to shift the stop loss to 200 on stock moving in the positive territory. The stock in its bullish upmove can target 220 levels. We are proud of the fact that our clients traded this stock today and made phenomenal profit and this is the power of best intraday tip as we believe in trading minimum but trading accurately. Our clients are long in the stock. As a strategy one can short the stock once it breaks the level of 195 as thereafter in its downward journey stock can find support at 193,190,182 and below levels. This analysis is made on 21 Oct 2013 and thus date be kept in mind while viewing the chart for technical perspective.